Posted on June 17, 2010 June 18, 2010 by John McHugh M.D. These questions are fair and appropriate questions and serve as a good starting point, however the real question is “Who are you?, What are the specifics of your disease?, and What is your assessment of the risks vs. cure ratio? When the patient get this, then it becomes all about him. It is one of the few times it can legitimately be ” all about you.” So don’t do what your brother did, don’t do what a friend did, and don’t do what the guy at the gym said that his friend that went to a fancy doctor in wherever did. You do what is specific to you. What other’s did about their cancer serves as a database from which to draw from, not the template of what you do. It is all about apples to apples and prostates to prostates. I am asked this question ( What would you recommend if I were your father?) very often after telling a family that a biopsy shows prostate cancer. I almost anticipate it and have to be careful not to smile after hearing it; certainly a smile after delivering bad news would come across as inappropriate. The irony of the question is that I am not a big fan of my father. He left my mother and her five boys when I was in the seventh grade and moved to Alaska. (That he went to Alaska reminds me of Jonah rejecting God’s command to go to Nineveh. Jonah instead went to Tarshish; a location that was not only in the opposite direction but a “far and distant land.” I have often thought that Alaska was my father’s Tarshish.) I saw him only one time after that, when he showed up at my part-time job during the Christmas break of my freshman year in college. He quizzed me briefly about my grades, told me that his had been better at Auburn University, and then left. I never saw him again. After the divorce, my mother, brothers, and I moved to 103 N. Lewis Street LaGrange, Georgia to live with my grandmother Bess Davis who was 73 at the time. Looking back on it, this was one of the best things that could have happened to me. LaGrange was a great place to grow up, I adored my mother and grandmother, and I feel that not having a father to depend on made me a stronger person. So, when the inevitable question comes up, I fight back the smile and answer the question as if it were a good one, in the context of a normal father-son relationship. Kudos to your Mom and Gram!! You have to tell us who’s who in the photo. Are you the blond boy in front? Who are the others? You have mentioned Rushton and Bob. Anyway, those two fine ladies did a great job of raising five boys!!! I was in hopes you’d ask. Facing the picture: Rushton is back left, Cooper back right, Bob in the middle, John front left ( with bleached hair, something for some reason I did every summer ) and Jeff front right. 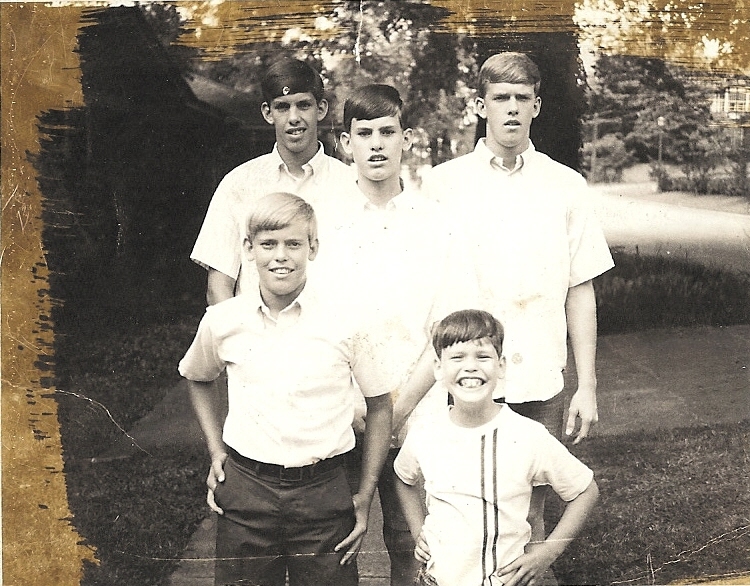 Odd coincidence: I too had 4 brothers (and no sisters). My dad essentially left us when I, the oldest, was 15, the boys were raised by mom alone, on a teacher’s salary, in Port Arthur, Texas. I am a doctor too (an ER doctor in Georgia, about to retire after 30+ years, both private and academic), and I had a RALP last year, age 63. My PSA was 23 and bx was Gleason 9, no sx except mild prostatism. I got a PSA after my little brother was dx’d w prostate cancer after insurance physical PSA. My CT/bone scan were negative, surg margins negative. But no attempt at nerve preservation. Are you guys more aggressive in surgery with more aggressive pre-op status? A year later I’m never dry, use 5 pads a day, no response to Viagra and inadequate response to 1 cc of trimix, and quite a bit of penile retraction. Pretty unhappy with my fate, happy to read of your misgivings about radiation though: helps temper my regret a little. I’ve enjoyed your blog, thanks for sharing the info which others like me might consider a little too private. Just reading online, I’m considering artificial urinary sphincter if my urologist thinks it appropriate. I would love to be able to travel internationally, exercise, have a beer, go to coffee shop without that anxiety. But I count my blessings, when I consider all the young men who die in war, or survive with disabilities far worse than mine. Previous PostPrevious “Who are you” trumps more prostate cancer information regardless of the format.